Fully furnished apartments that have been recently renovated. This is a large 2 bedroom, 2 bathroom apartment and it includes high speed internet, heat pump, washer, dryer, in floor heating in the bathroom, balcony and more. 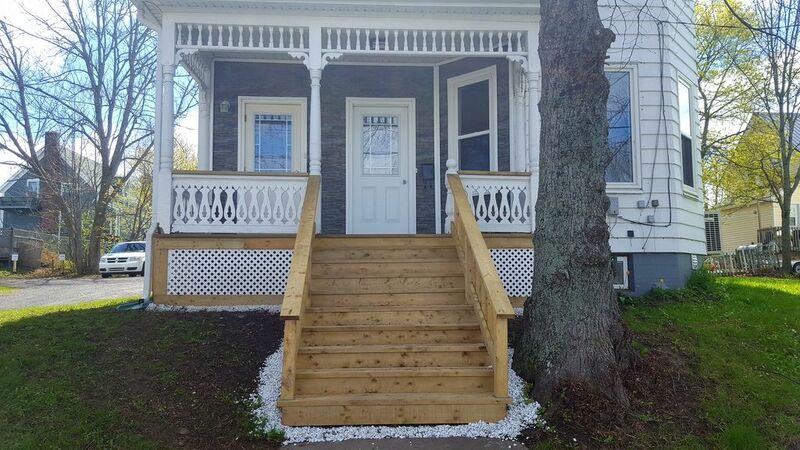 Located walking distance to downtown New Glasgow, grocery stores, and the movies. It is a 20 minute drive to the PEI ferry. The historic Town of Pictou is located 15 minutes by car, and Melmerby Beach is 20 minutes away. We had a comfortable stay in this very nicely renovated older home. Well stocked with everything you need. The owner Svilen is very hospitable and seems like a great guy! On our long journey this was the highlight of our trip! Love that main floor shower - what a treat!! Thanks Svilen - we would definitely stay at your place again anytime! Thank you for the kind words. All the best to you and your family. Lighter and brighter than pictures suggest. Plenty of room. Beds good. Bathrooms very nice. Owner friendly and responsive. Dry good position for exploring north Nova Scotia. Quiet. Very close to town. Lovely market on Sat. Friendly people in New Glasgow. Old home charm with many modern upgrades! This place is a GEM! Svilen greeted us promptly and was available quickly by email. The property was immaculate, many amenities included. It was central for our travels around the province and to PEI throughout the week. Would love to rent again if we ever head back this way! Thank you! I appreciate the kind words and we hope to see you again. Great little home away from home. We searched for a place that was central to everything we wanted to see (Halifax, Peggy's Cove, Cape Breton &Cabot Trail, PEI etc) and this house was perfect for us. There were 4 of us and we had plenty of room. Everything you need is supplied. If I had to list any cons it would be the hard mattresses, (my personal preference is a softer one). Also, we stayed during a heatwave with high humidity and no breeze and found that the air conditioning in the livingroom didn't reach either bedroom. The owner is very quick to respond to emails and he even met us upon our arrival and gave us a tour of his property and showed us how everything worked. We would definitely recommend this home and hope to stay there in the future. This property was newly renovated in a with modern fixtures and conviences, Svilen was was very helpful. I did not expect this level of fit and finish for a property at this price. fantastic value, location and a great experience with the property owner. I would not hesitate to recommend this property to a friend. Thanks Svilen.